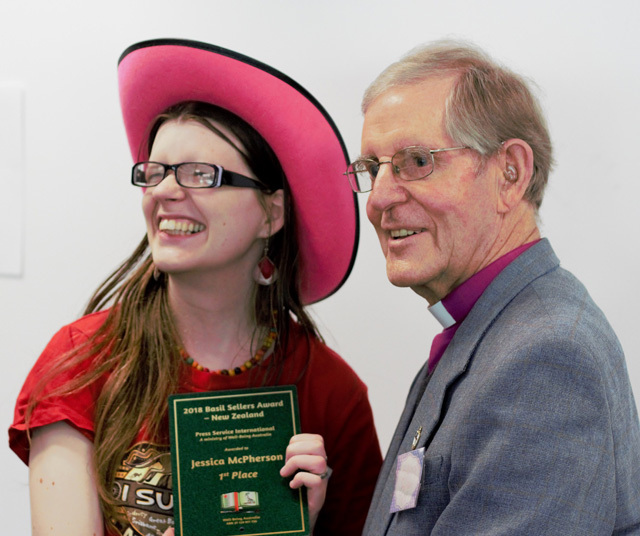 Bishop Brain Carrell addressed the annual young writers conference in Christchurch in September but his association with the young writers goes back to 2013. That was the year the Kiwi young writers articles began to be marked and we required two New Zealanders to be part of the seven person panellist team - Christchurch’s Bishop Brian Carrell and the NZ Salvation Army’s Christina Tyson. Kiwi young writer Sophia Sinclair who at that time was with CMS in Christchurch recommended Bishop Carrell and therefore the relationship was initiated. 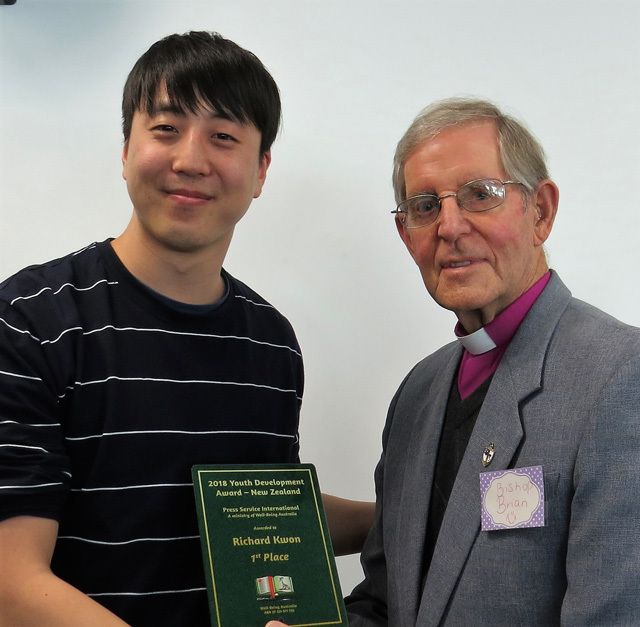 Along with becoming a panellist for the young writer program to determine the annual awards, Bishop Brian Carrell wrote a book, which had pre-launch sales, and this 2013 book broke the mould. In Anglian Church terminology the Right Reverend Brian Carrell (that means Bishop in the Anglican world) who penned this well rounded prayer book whose material is said to be “a treasure” (Taonga). What's he's done is to explore ideas, ideas about what others have referred to as the inside story of the creation of a most treasured and loved prayer book of a nation. It's published from Theology House in Christchurch. This book does more than update a prayer book. Rather it imaginatively tells the intriguing 25 year story of the process, people, problems and politics leading to the production between 1964-1989 of the current NZ Prayer Book – which is used throughout the Anglican Church on that side of the Tasman. Herein lays the drama of any prayer book compiled by a commission. It is both a game and bold person, however well credentialed within any denominational family, to take it on, so to speak, and come up with something worthy of ancient applause. So what was Brian Carrell's secret? Being a bit of book worm (saying he is “a bit of a book worm” has a little hyperbole to it) he went back to basics, the original sources (I did that in my New Testament Greek studies and Church History research 41 years ago at seminary) and dug out the working notes and the detailed associated with those notes and good grief, he found the Minutes, of the Prayer Book Commission. What did the good Bishop do? Like any theological scholar he sets out to bore the reader. No. No, No. (another dad joke). Rather he makes it interesting and explains the process of the content and structure of that original prayer book, including its genesis. It's a good read. Little wonder there was a clamour to get a hands-on copy. Perhaps it's to see whether there's any ecclesiastical blood on the floor from the original commission. We all know about church committee's – not the friendliest of places when contentious issues come up. And come up they do. I testify this as a student of Church History with 1st Class Hon., and in Australian Baptist Church life for 41 years. Archbishop David Moxon calls the publication “a remarkable gift” of memory and story, and says it pays “meticulous attention” to the prayer book’s production. “In these pages you will find the human stories, the theological nuances and the spiritual vision that came together in one of the world’s most creative and beautiful prayer books. (The ACC stands for Anglican Consultative Council, the international body that oversees the global Anglican Communion - see, I told you how precious these ecclesiastical high fluting groups are - Baptist like me have them too, we call them different names, such as the Theology Committee – I know, how boring). 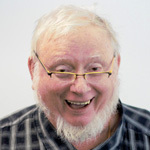 Back to John Paterson: who reminds the Church that those who served on the Prayer Book Commission have never been adequately acknowledged for their outstanding service. (I knew that! - I've been on these things, you never get a Gold Medal like the swimmers). As one might imagine Bishop Brian Carrell has been ‘solid gold’ for the Kiwi young writers all these years. He presented the Kiwi young writer awards and in his presentation he explained that in his diverse ministry including CMS, this young writer ministry capturing the next generation was in his mind one of the outstanding youth accomplishments in his many years in ministry. He cited the changing nature of the Kiwi young writers, from inward self reflection to a broadening scope of reviewing society and specific entanglements which the Christian community needs to tackle. Fresh young eyes have been most rewarding. 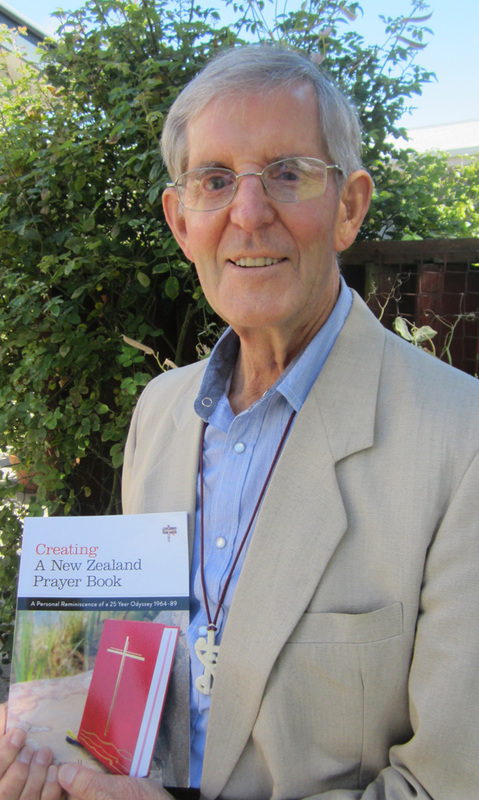 Meanwhile - How to get the book - Brian Carrell, Creating A New Zealand Prayer Book: A Personal Reminiscence of a 25 Year Odyssey 1964-89. Christchurch: Theology House Publications, 2013. 125 pages. ISBN: 978-0-473-23061-6.